Writing term papers is not a pretty affair--at least in my case. The dishes pile up. I don't bother with my hair. I grimace a lot. So, I'll have to be brief today. A few weeks ago, I finally kneaded together a batch of Milk Bar "mother" dough and baked up a few bagel bombs to share with the other sleepy-eyed folks in my early-morning political philosophy seminar. The bagel bomb is Christina Tosi's nod to the New York bagel, sesame seeds, dried onions, garlic powder, and all. Bite into one and you'll get the "bomb" bit--think bacon-scallion cream-cheese explosion. I think they went over pretty well with the class. I might have seen a person or two reaching for a second, maybe even a third bomb...but I won't mention any names. Munching on bagel bombs definitely helped the morning along, but, really, I still think that I got the best of it while making them earlier that week. 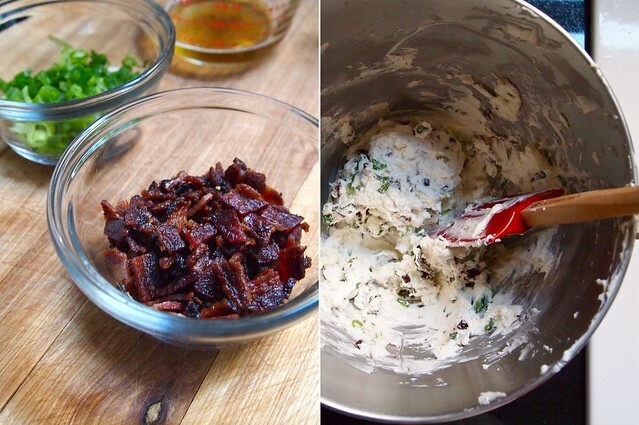 That bacon-scallion cream cheese? Totally amazing and dead easy to make too. I'll admit to having had a taste or two and maybe to licking the stand-mixer paddle clean. Hey--I get to when I'm doing the baking, right? But in all seriousness, I have to say that after its spell in the oven, the cream cheese tucked into each bomb isn't nearly as good. The scallions lose their pluck. The cream cheese gets a little curdled. Next time around, I think I might just try my hand at some proper bagels and paddle together this cream cheese to mound on top. If you ate sour-cream-and-onion chips with abandon as a kid like I did, this is your cream cheese. Cook the bacon in a skillet over medium heat until it's auburn brown and crunchy. Remove it from the pan and chop it into small pieces; reserve it and, separately, the rendered bacon fat. Put the cream cheese in the bowl of a stand mixer fitted with the paddle attachment and cream it on medium speed. Pour in the reserved bacon fat and paddle to combine. Scrape down the sides of the bowl. Add the chopped bacon, scallions, sugar, and salt and paddle briefly to incorporate. One last thing: to help out those of you who already have the relevant cookbook and who might want to tackle a project I've posted about, I'm going to be adding a few technical notes to the end of my project posts from now on. I hope some of you out there will find them helpful! Oven temperature: the recipe directs you to bake these at 325 degrees F, but even when I baked the bombs at 350 degrees for 30 minutes, I wasn't getting any colour on them. I tweeted Tosi about it (it's a thing she does every Friday), and she suggested that I give them a minute or two on low under the broiler. It did the trick. Yeast: the "Ingredients" section at the beginning of the Milk Bar cookbook says to use active-dry yeast, but I'm pretty confident that you should be using instant yeast for the mother dough. First of all, the active-dry stuff won't break down unless you dissolve it in liquid. 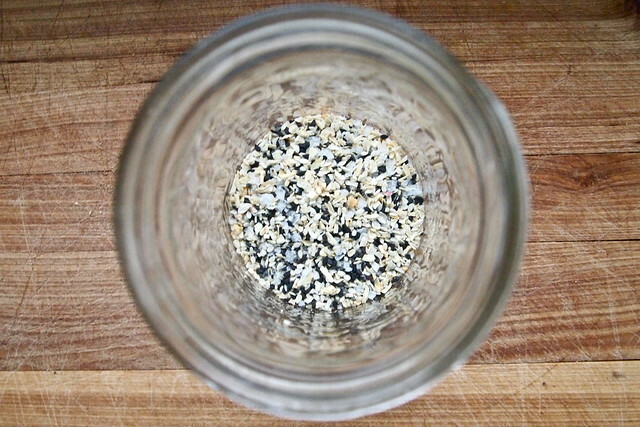 Second, the quantity of yeast and the time allotted for proofing are more appropriate for instant. 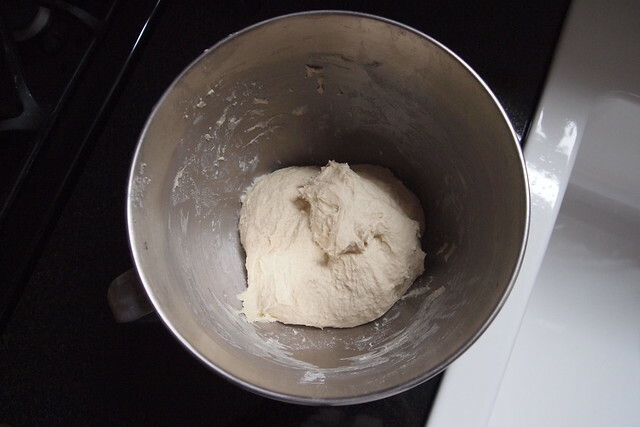 Dough: the mother dough is probably a little wetter than the average bread dough--just keep your hands floured. Wow, these look awesome. Really--that second big picture, with the bagel bombs all lined up before getting in the oven? So good! I could just imagine the flavors when I was reading this/looking at the pictures. Funny how the tastes didn't translate so strongly in their baked form, though. 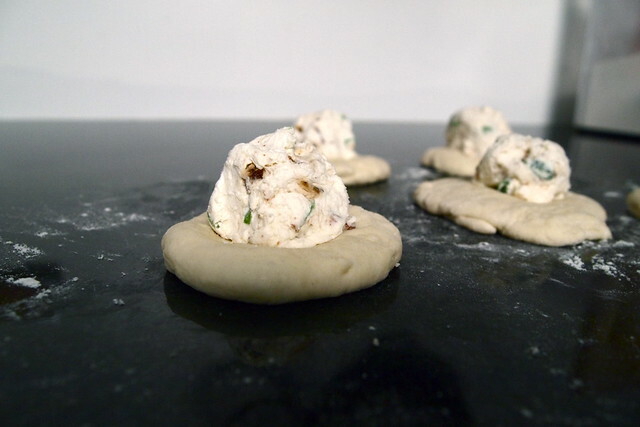 I want to try out making some homemade bagels one of these days and now when I do (which is hopefully not forever from now), I'm going to make some with the "everything" flavor topping and make some of that bacon-scallion-cream cheese mix to serve with it. Oh my god just writing that out made me want to eat it now! Bagels!!!! I love bagels, like a whole lot, or should I say 'hole' lot. hehe. 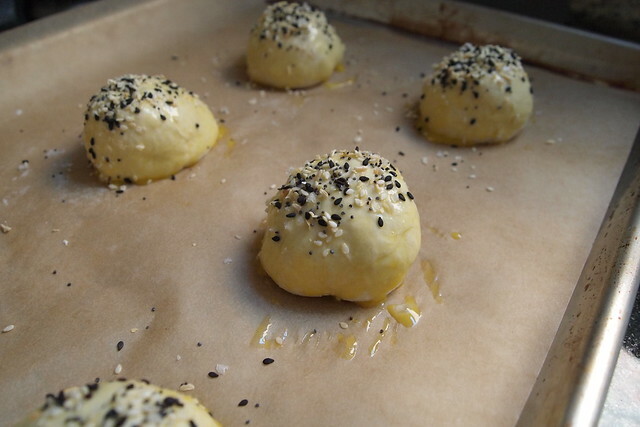 I love the idea of these bagel bombs, but in all honestly I like controlling the amount of cream cheese that I get per bite...and I'd worry that this might be too much 'bomb' for me, especially if the taste didn't really work as you'd expect. That all said I'd probably eat these without even thinking twice because they look so darn cute! They do seem much easier than homemade bagels with all the sitting and dunking and baking (or maybe you do have to do that...) You've done a good job convincing me that I should get the Milk cookbook. It's so creative. 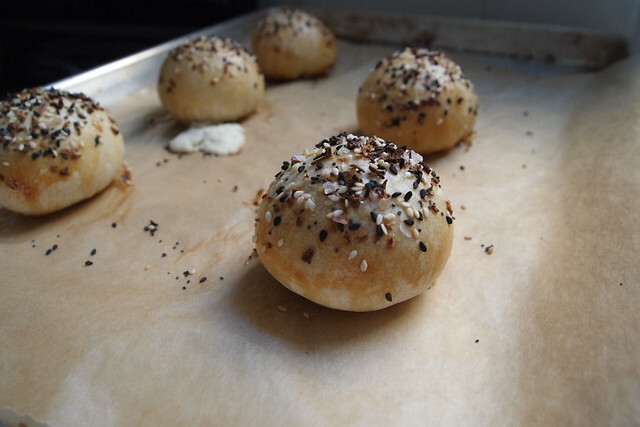 Your bagel bombs look fantastic! I love your bacon pic. Does the cream cheese seep out of the bagels as they bake? Or does it--for the most part--stay inside? I've been considering making these for a while, so it's great to hear someone else's opinion on them before I attempt to tackle them for myself. This is kind of random, but I was wondering how you keep the text on your posts aligned with your photos, as well your blog's title with your posts and the sidebar. When I try to do this, the text on my posts stretch out further than the photos. Your blog is so clean and streamlined, I just had to ask! OOOh good luck with your project! I love the sound of this cream cheese - I am thinking we might make some to put on top of these salmon burgers we just bought... salmon, cream cheese, bacon, scallions.... has to work right!?!? Thanks, Amy. Yeah, everything bagels are definitely my favourite. A lot of people have had luck with the Peter Reinhart bagel recipe from BBA. I think The Wednesday Chef posted it about a year or so ago, so you might want to check there. I've executed it unsuccessfully before, but that was just because I didn't add as much flour as I was supposed to, I think. Talley, the bagel bombs are way easier to make than NY-style bagels--the dough isn't as stiff, and the bombs don't get a baking soda bath. Unless you're really sparing with your cream cheese, I don't think that the bombs will be that much of a problem for you. Each one contains probably about 1 to 1 1/2 tablespoons of cream cheese. Thanks, Courtney. I don't know if there's a rule to how much the bombs will gush. The ones that I baked within the first couple of days pretty much all exploded a little bit. The ones I baked four days after making the mother dough didn't do much exploding at all (the ones I've photographed). The dough was a little slack by then--maybe that had something to with it? Anyway, even the ones that exploded the most didn't seem to lack filling when you bit into them. If you're worried about that, you can do as Tosi says and poke the filling back in with your finger. It works. Em, that sounds great. Definitely has to work. These look really really good, and sound like such an amazing idea. I love cream cheese and spring onions, and can only imagine the bacon just improves everything! I just want to sink my teeth into thirty of these.